Shanghai has seen high-quality development in attracting foreign investment in 2018, a conference on business development announced on Jan 22. According to statistics released by the Shanghai Municipal Commission of Commerce, Shanghai has gained 5,597 new foreign-funded projects, attracting $46.94 billion in contractual foreign investment and $17.3 billion in actual foreign investment, representing increases of 41.7 percent, 16.8 percent and 1.7 percent compared with 2017. The number of new foreign-funded projects and actual foreign investment in the service sector accounts for 96.9 percent and 89.3 percent respectively of Shanghai's totals. Emerging service industries such as Internet plus-driven information services and financial services centering on financial leasing and auto finance saw increases in actual foreign investment. At the same time, traditional services attracted less foreign investment. The housing industry, for example, experienced a decrease in actual foreign investment for the third consecutive year as its proportion in Shanghai's total foreign capital fell to the lowest level at 10.8 percent in recent years. The commercial service industry, dominated by headquarters of multinational companies, has earned $5.52 billion in actual foreign capital, up 10.5 percent over the previous year. 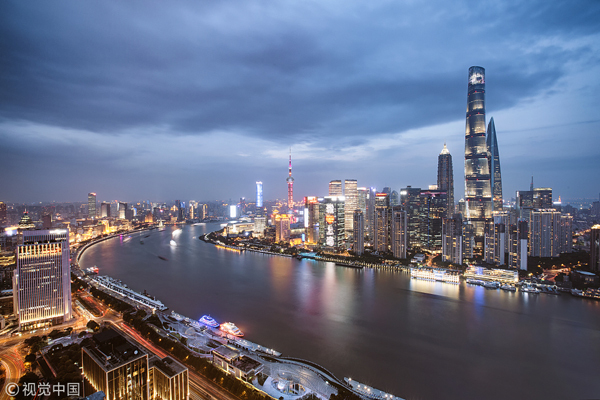 Shanghai has introduced 670 regional headquarters of multinational corporations, including 88 from the Asia-Pacific region, with an increase of 45 in 2018 alone. In 2018, Shanghai's 128 new foreign-invested manufacturing projects gained $1.78 billion in actual foreign investment, 60 percent of which went to high-tech projects, a substantial increase of 91 percent over the previous year. Tesla new energy vehicle manufacturing project in Pudong, Shanghai, for example, with a total investment of 14 billion yuan ($2.08 billion) is the city's biggest-ever foreign-invested manufacturing project, and is also the first wholly foreign-owned project in automobile manufacturing in China. The science and technology service industry reached $740 million in actual foreign investment, up 19.8 percent over the previous year, and attracted 15 foreign-invested research and development (R&D) centers. By the end of 2018, there were 441 foreign-invested R&D centers in Shanghai, including 65 in the Asia-Pacific region.